This past week I decided to jump back on my Pinterst Challenge bandwagon and try 3 new recipes. And to my surprise they all turned out well, and took no time to make at all! Plus I had plenty of leftovers that were delicious and easy to pack for work! These recipes were to good to keep to myself - check it out! Delicious - The Feta added great flavor! This dish was a great meatless main but you could easily top with grilled chicken or add some beans to keep it vegetarian! 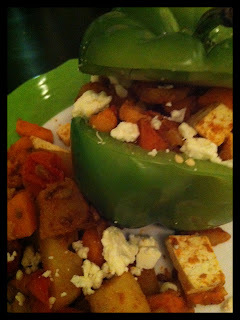 Sweet Potato Stuffed Peppers - From Natural Health Mag. Yes, I will admit I have a million stuffed pepper recipes on the blog! But the thought of adding sweet potatoes to my pepper stuffing intrigued me. The end results... delicious! I cut the recipe in half and made one stuffed pepper. I used the extra pepper stuffing to top a salad for lunch the next day! These bars are delicious and addicting! They are not super sweet and have a wonderful peanut butter taste! I made them for my team at work and got tons of compliments! These make a great snack or a healthy dessert! Make them as soon as you can! I also dug this recipe out from the archives! 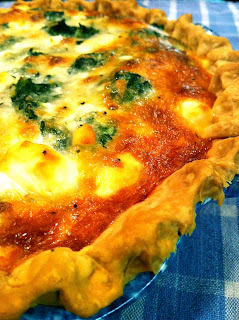 I made this Quiche for Derek's cousin Nikki and her husband. Derek and I took them dinner on Thursday night because they just had their little girl! Their baby girl is adorable and I loved being able to spend the evening with them. I have to say that I forgot just how much I love this Quiche, the guiche turned out perfect just as it always does!